Nikon has announced the development of a new super-telephoto lens, the AF-S NIKKOR 500mm f/5.6E PF ED VR. While only a few details have been confirmed, Nikon has stated that the lens will offer "exceptional agility and optical performance". The lack of a DX suffix in its title also makes it clear that the optic will work across both FX- and DX-format bodies, with the latter combination providing an effective focal length of 750mm in 35mm terms. As the name also makes it clear, the lens will feature a Vibration Reduction system and be furnished with Extra Low Dispersion (ED) glass, and should also have an electronically controlled diaphragm. It's also set to be designed with a Phase Fresnel (PF) element, which is also used in the AF-S NIKKOR 300mm f/4E PF ED VR that was released three years ago. This is said to allow for a more compact and lightweight design that would be otherwise possible (as the lens can used fewer elements), which in turn should make handheld shooting easier, although the primary reason for using these elements is that they can help to control chromatic aberration when used alongside regular glass elements. Nikon hasn't stated a recommended retail price for the new lens, although with its current AF-S NIKKOR 300mm f/4E PF ED VR priced at around £1710 in the UK and its wide-aperture AF-S NIKKOR 500mm f/4E FL ED VR retailing at around five times that figure, we would expect a lens with its specs to be priced someway between the two. 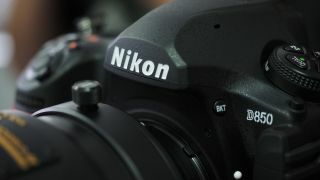 Nikon also hasn't stated when when we may expect to see it arrive, although we would expect to see at least a prototype of the lens at this year's Photokina event in September.